A Powell Butte man was identified as one of two Knife River construction workers seriously injured after being struck by a vehicle on Interstate 5 Tuesday. 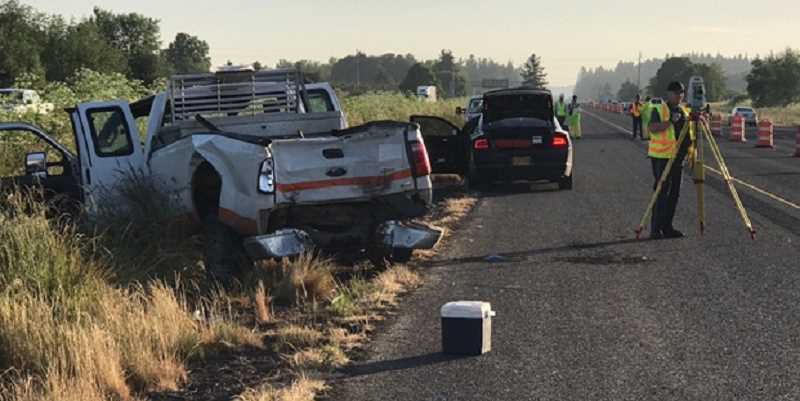 Oregon State Police identified the two victims as Ronald Ernest Davis, age 57, of Powell Butte and 20-year-old Antonio Manuel Bahena of Troutdale. According to OSP reports, on Tuesday morning, at about 3:15 a.m., the two construction workers were clearing the roadway on I5 at milepost 280 northbound, when a white box truck traveling northbound collided with a Knife River construction vehicle, injuring two construction workers. Both workers were transported to local hospitals with serious injuries. The box truck continued northbound, failing to stop at the scene. The driver of the box truck, Colin Michael Cook, age 27, of Fairview, was arrested for fail to perform duties of a driver/injury, assault II, reckless driving and reckless endangering. He is in custody and will be lodged in Marion County Correctional Facility. "This is a terrible situation that did not have to happen," said Brian Gray, president of Knife River's Oregon operations. "Our team members were working in the closed lane, on the other side of traffic barrels when their vehicle was hit. We ask two things: Please keep our injured team members and their families in your thoughts, and please pay extra attention and slow down in work zones so something like this never happens again." Both workers continue to receive treatment at local area hospitals.